Completely revised, updated, and enlarged, this second edition now contains a subchapter on biorecognition assays, plus a chapter on bioprocess control added by the new co-author Jun-ichi Horiuchi, who is one of the leading experts in the field. 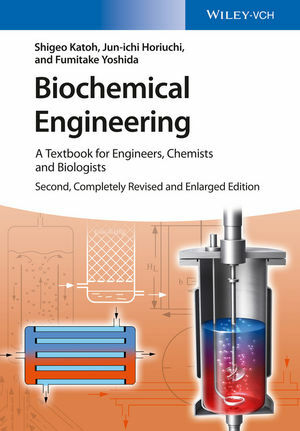 The central theme of the textbook remains the application of chemical engineering principles to biological processes in general, demonstrating how a chemical engineer would address and solve problems. To create a logical and clear structure, the book is divided into three parts. The first deals with the basic concepts and principles of chemical engineering and can be read by those students with no prior knowledge of chemical engineering. The second part focuses on process aspects, such as heat and mass transfer, bioreactors, and separation methods. Finally, the third section describes practical aspects, including medical device production, downstream operations, and fermenter engineering. More than 40 exemplary solved exercises facilitate understanding of the complex engineering background, while self-study is supported by the inclusion of over 80 exercises at the end of each chapter, which are supplemented by the corresponding solutions. An excellent, comprehensive introduction to the principles of biochemical engineering. Prof. Shigeo Katoh is now Professor emeritus at Kobe University, Japan. He was - after his retirement - a full professor at Hanyang University at Korea and a visiting professor at Cheng Kung University at Taiwan. Before his retirement, he was Head of the Bioengineering Laboratory at Kobe University, Japan. He holds a PhD in Chemical Engineering from the University of Kyoto, Japan. Prof. Katoh is an enthusiastic lecturer in Biochemical Engineering, Bioseparation Engineering and Immunotechnology. He is an outstanding expert in biochemical engineering and has published numerous papers in this field. Prof. Jun-ichi Horiuchi is Director of the Instrumental Analysis Center at the Kitami Institute of Technology (Japan) since 2010. He obtained his Master degree in Engineering from Hokkaido University and thereafter went to the Science University of Tokyo, where he received his PhD in biotechnology in 1995. Afterwards he spent several years as research engineer at Toyo Engineering Corporation, before he became Professor at the Kitami Institute of Technology in 1998. Prof. Horiuchis research interests are in the field of bioprocess control and optimization and up to now he published over 60 peer reviewed jounal contributions, 12 patents and 9 book contributions. Prof. em. Fumitake Yoshida was one of the world's most respected chemical engineers. Most recently he was professor emeritus of chemical engineering at Kyoto University and well beyond his retirement he continued to be a visiting lecturer at universities around the world. He conducted research on various mass transfer operations, gas-liquid systems in particular, investigating their applications in bioengineering and medical technology. Yoshida received his BS and PhD degrees in engineering from Kyoto University. Among his many awards and citations was election to the National Academy of Engineering of the United States in 1979 for his leadership in chemical, biochemical, and biomedical engineering in Japan.